Where is the the DPRK? DPRK stands for Democratic People’s Republic of Korea (DPRK; Chosŏn’gŭl: 조선민주주의인민공화국; Chosŏn Minjujuŭi Inmin Konghwaguk). In the UK it’s more commonly referred to as North Korea. It is a country in East Asia, in the northern part of the Korean Peninsula. 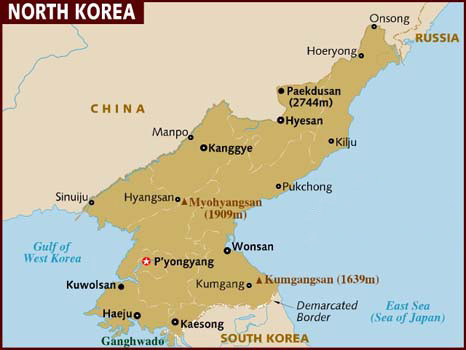 The capital and largest city is Pyongyang. North Korea shares a land border with China to the north and north-west, along the Amnok (Yalu) and Tumen rivers. A small section of the Tumen River also forms North Korea’s short border with Russia to the northeast. The Korean Demilitarized Zone marks the boundary between North Korea and South Korea. The legitimacy of this border is not accepted by either side, as both states claim to be the legitimate government of the entire peninsula.